Throughout the season, Masuk High School's football team has feasted on the opposition, beating each opponent by no less than 23 points and scoring 50 or more points five times, on its way to a 9-0 record. In the annual Thanksgiving clash with South-West Conference rival Newtown, the Panthers had their hopes of an unbeaten campaign stuffed as the visiting Nighthawks earned a surprising 14-7 win. Another victory would not have been just gravy for the Panthers; pending other outcomes, they may have needed it to secure a first-round state playoff home game. Either way, the Panthers will play on in the postseason but Newtown's sweet potatoes will taste a little sweeter with the upset victory capping a 7-3 campaign. The Nighthawk running game took advantage of strong offensive line play as Dan Mason mashed his way into the end zone for both Nighthawk scores. Masuk scored first, on a nine-yard touchdown pass from quarterback Matt Hersch to Nick Lorusso in the first quarter. It remained 7-0 until the late stages of the opening half. One play after Newtown's defense forced a punt, Mason ran up the middle for a 49-yard game-tying score with just 36 seconds left before the half. Masuk's Robert Martinsky intercepted a pass less than a minute and a half into the third quarter, giving the Panthers possession at the Nighthawk 17, but Newtown's defense forced a 28-yard Nolan McCarter field goal try which sailed wide left. After the teams traded punts, Newtown's Joe Pagett recovered a fumble at the Masuk 33 yard line. On third and nine at the 21, Newtown QB Ryan Kost moved the chains with a clutch 14-yard completion to Matt Dubois. First and goal at the seven. Two Mason carries later, and the Hawks had the lead. Mason plowed into the end zone from two yards out on the final play of the third quarter. In the fourth, the Panthers drove to the Newtown 25 but ultimately turned the ball over on downs. The Panthers got the ball back on a punt with 4:27 left, but again turned the ball over on a failed fourth down conversion. On fourth down, Masuk went to some trickery to attempt to generate a spark on offense. Hersch handed off to Michael Zuk who gave the ball to Ryan Shaw, and threw an incomplete pass out of bounds. 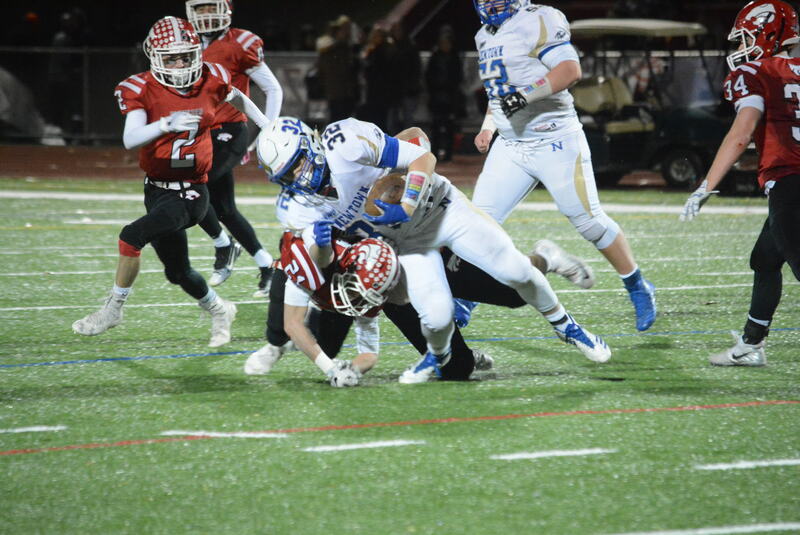 Newtown took over at its own 45 with 2:07 left and ran out the clock thanks to Mason's rushing efforts, including a gutsy fourth down chain-mover. Facing a fourth and three at the Panther 35 with 19 seconds to play, the Hawks opted not to punt and Mason fought to the 31 yard line to seal the victory. "Masuk is a great team - very skilled. I think one of the things we felt we could take advantage of was running the ball. 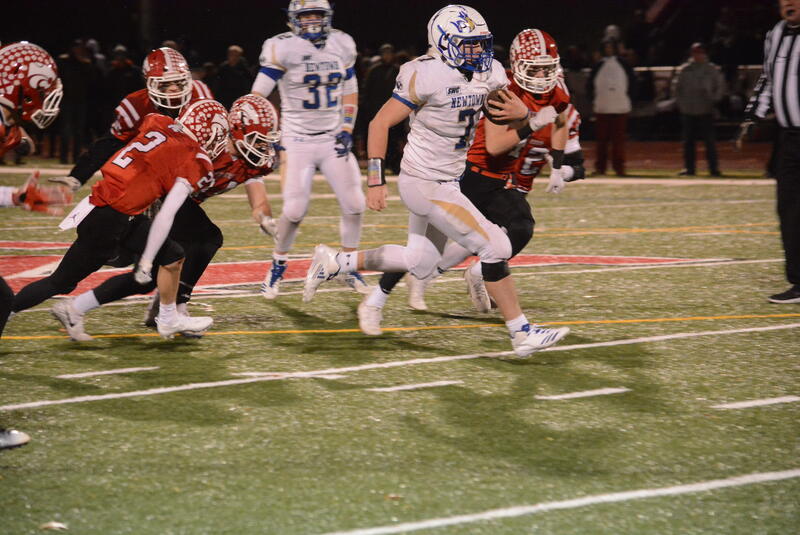 We have a size advantage," Newtown Coach Bobby Pattison said. "We shortened the game, we chewed up clock. We put it on the linemen." Pattison said the Hawks used the team's underdog status in the media as fuel for its fire to win. "We weren't supposed to win. This was supposed to be Masuk's year. I think that was a motivating factor for our guys," Pattison said. "We won a game we weren't supposed to tonight." Read more about the win in the December 1 print edition of The Bee.